While estimates of the number of persons trafficked vary, IOM found that the global number of persons trafficked per year ranges from 600,000 to 4 millions. Since 1997 IOM has assisted mre than 60,000 victim of trafficking. US Trafficking in Persons (TiP) report 2018 mentioned about the identification of 100,409 victims globally, out of them 23,906 are subject to Forced Labour. Even this staggering figure is largely considered a conservative estimate given the clandestine nature of the crime, and the strict methodology applied. UNODC’s 2016 Global Report on Trafficking in Persons demonstrated that, while human trafficking is truly a global phenomenon, it most commonly occurs intra-regionally, with each region and sub-region experiencing unique and geographically-characterized patterns for origins and destinations. It is also found that the Asia-Pacific region records by far the highest rates of human trafficking in the world. The Republic of Korea is a member of the Bali Process on People Smuggling, Trafficking in Persons and Related Transnational Crime (Bali Process). Since 2002, the Bali Process has effectively raised regional awareness of the consequences of people smuggling, trafficking in persons and related transnational crimes, and has developed and implemented strategies and practical cooperation in response. This voluntary forum includes 45 participating countries, as well as IOM, UNHCR, UNODC and ILO (recently became member). The core objectives of the Bali Process are to combat people smuggling and trafficking in persons by developing more effective cooperation and information sharing between Bali Process members and other relevant organizations; to raise public awareness and educate vulnerable populations about the crime of people smuggling and trafficking in persons; to build capacity across Member States and facilitate the sharing and implementation of best practices; and to advance the Bali Process Regional Cooperation Framework (RCF) as a means of adopting a comprehensive and holistic approach towards combating people smuggling and trafficking in persons. The Regional Support Office of the Bali Process (RSO) was established in 2012 to operationalize the RCF, in order to reduce irregular migration in the Asia-Pacific region. Drawing on the engagement created among the Bali Process Member States on issues related to counter trafficking, the RSO supports practical cooperation on refugee protection and international migration, including human trafficking and smuggling. Its activities are supported by the knowledge, expertise, and experience of Member States and international organisations, including IOM, UNODCand the UNHCR. CIFAL, in affiliation with UNITAR, has become a knowledge hub and platform for promoting city-to-city cooperation. Through this approach, CIFAL directs its capacity building efforts towards local actors. 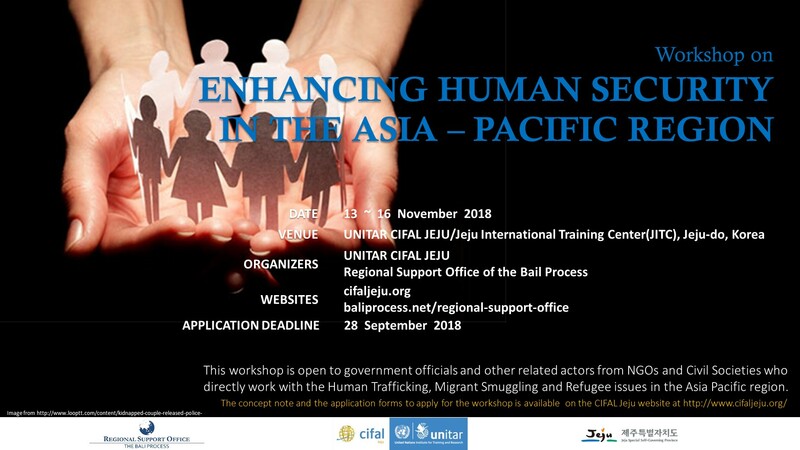 CIFAL Jeju / Jeju International Training Center (JITC) focuses on the thematic area of social inclusion, especially with regard to human trafficking issues which impact the capability of human beings to drive their own lives and decide their own futures. Cities in the Asia-Pacific region can substantially improve the situation by focusing and sharing experiences on the prevention of trafficking, prosecution of traffickers and the protection and reintegration of victims of trafficking. Therefore, this training aims at strengthening the role of local authorities and actors in the Asia-Pacific region to better identify and protect victims of trafficking. ● Promote information sharing and exchange of best practices between central/provincial governments and NGOs/local actors. ● be able to build professional networks, exchange information and knowledge. of trafficking in the Asia Pacific region. ● submit necessary documents on time, i.e., registration form etc. ● complete and submit pre-training readings and assignments, i.e. case studies etc. ※ Late application will not be accepted. ● Application without required documents will NOT be considered. ● Participation is subject to approval of the application by UNITAR CIFAL Jeju/JITC. ● Selected applicants will be notified individually. ● UNITAR CIFAL Jeju/JITC provides a LIMITED financial assistance with the airfare to Jeju-do, Republic of Korea. ● Local expenses (transportation, accommodation and meals) during the workshop will be covered by UNITAR CIFAL Jeju/JITC. ● All other expenses (local transportation in their country, visa fee) are the responsibility of the participants.